Also see other Flux Staves ( Disorder, Turmoil, Bedlam, Anarchy, Chaos), Flux Glaives ( Disorder, Turmoil, Bedlam, Anarchy, Chaos), and Flux Flails ( Turmoil, Bedlam, Anarchy, Chaos). On both normal attacks and the Special, the weapon's Element is randomly selected from the eight base Elements. A = Your alignment, regardless of whether it is positive or negative. If you are Chaos aligned: On both normal and special attacks, the weapon has a chance of (A/1.7) to Weakness Seek*. On the special, the weapon increases its Random damage to [100 + (A/34)]% of normal. If you are Unity aligned: On both normal and special attacks, the weapon has a chance of (A/1.7)% to Strength Seek**, that is, to use the element to which your opponent is most resistant. On the special, the weapon reduces its Random damage to [100 - (A/34)]%. *You are in tune with the chaos of your weapon and focus on your opponent's weakness! **The chaos in your weapon rebels against your touch and strikes your opponent's strength! 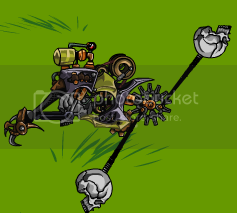 Description: This chaotic weapon hits your enemy for a random element, but has a chance to seek the enemy's weakest element-- unless you are aligned to Unity, in which case it will seek the enemy's strength!